For those who haven't read "The Hunger Games" trilogy yet, the final trailer for "Catching Fire" shows just how much the stakes have been raised. While the official trailer, released over the summer at Comic-Con, introduced the overarching plot for the second installment of "The Hunger Games" franchise, something about hearing President Snow's ominous threat in a voiceover makes it all the more chilling. "Miss Everdeen, you fought very hard in the arena, but they were games," Snow, played by Donald Sutherland, says in the final clip, which aired on Sunday night during Game 4 of the World Series. "Would you like to be in a real war?" That's all the dialogue we get in the action-packed sequence, which highlights the terror Katniss Everdeen (Jennifer Lawrence) and Peeta Mellark (Josh Hutcherson) are up against in the arena this time around. "The Hunger Games: Catching Fire," which also stars Liam Hemsworth, Philip Seymour Hoffman, Woody Harrelson and Elizabeth Banks, opens November 22. The Hunger Games capitol city Panem is a metaphor for Washington, D.C.: A bloated self-absorbed totalitarian regime detached from the starving impoverished citizenry it is supposed to govern. This picture of game contestants surrendering their values in exchange for governmental support is emblematic of d I m o c r a t s, the parasite masses led around by their do-gooder know-it-all elites. Hillary 2016! Those games make me hungry. While Panem is a metaphor for DC, the rest of your analysis is as accurate and truthful as Fox News. 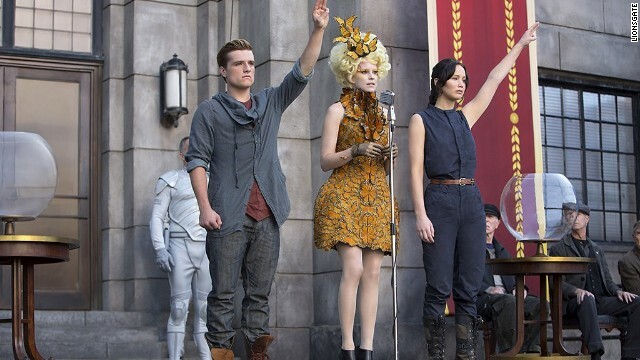 The ruling city of Panem represents the Republican commitment to the 1%. The contestants haven't "surrendered their values," they were enslaved. They don't "receive support," they are exploited. The rulers of Panem live lavish, excessive lifestyles while the rest of the country starves, just like the 1% worshipped by the Republican party. But nice try. Keep believing that. The facts do not support your assumption. Do your own research instead of swallowing everything they feed you. Hillary is more evil than Bill ever thought of being. What do you call a bus load of Tea Party 'Patriots' going over a cliff? Q: What do you call a bus full of liberals parked next to a manure truck? A: Two loads of krap.